what does GQ stand for????? I agree with you on that as to me it is almost heresy to put a set of chrome rims on a car like the gullwing. I don't watch F1 any more. What's happened to Martin Brundle? He's the only half-decent member of the comedy act. OK, it's getting worse. I give up. Martin Brundle will be the lead commentator for Sky TV. Wonder when the BBC will announce precisely which GPs they are planning to show? 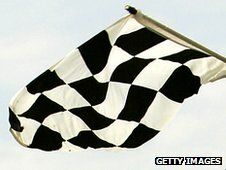 Ten races will be shown live on BBC One in 2012, including the British, Monaco and Brazilian grands prix. The 10 races shown live on BBC One and BBC HD will be: China (15 April), Spain (13 May), Monaco (27 May), Europe (24 June), Britain (8 July), Belgium (2 September), Singapore (23 September), Korea (14 October), Abu Dhabi (4 November) and Brazil (25 November). There will be extended highlights programmes on BBC One of the other 10, of either 90-minute or two-hour duration depending on the location of the race. So Kubica has broken his leg again, requiring surgery and metalwork..
As James Allen said today "If it wasn't for bad luck, Kubica would have no luck at all"
Whilst it's great to have 6 World Champions on the grid, we still need the Kubica's, Rosberg's and Di Resta's of the world to keep challenging. And on another note Lotus have managed to squeeze ride height control past scrutineering.. An interesting development? All 20 grands prix will be broadcast live on BBC Radio 5 live or 5 live sports extra. slipped on ice near his home and reopened a fracture in his right leg, setting back his rehabilitation further. According to the BBC he will need an operation to insert a metal screw above his ankle, plus more time in plaster. Just as things get interesting will Sky revert to the ITV habit of putting in an advert for something just like a Golf but not a Golf? Lon - Sky website clearly states "No advert breaks during a live race"
Sky wouldn't tell lies would they?? I have yet to see it in action but it seems the Spanish coverage is total BREAK free, they minimise the race to 1/4 of the screen and run the ad. I expect I will find out as my plan is to watch the non BBC races on Spanish TV and take R5 off the internet. Autosport is reporting Ferrari have a ride height system and expect FIA clearance, well they would wouldn't they. Not only Lotus, Ferrari have admitted to it too (damn, beaten by Wodrick ). Seems the concept was approved by the FIA as far back as a year ago, so I can see all teams having something similar by the start of the season. And the biggest budget will have the best system, you (I) would have thought this a movable aerodynamic device, or at least able to be interpreted that way, but it seems not so, with a years notice they will all have it. Renault (Lotus) come up with some good ideas it strikes me. By my understanding, it isn't classed as a moveable aero device à la Tuned Mass Dampers as it only works via the brake pedal and, I'm guessing, stiffens the front suspension depending on braking loads. It's not controlled by the driver (apart from when he stands on the brake pedal), it doesn't affect the car at any other time, so it satisfies the current regs (and has been developed by Lotus since 2010 with full knowledge of the FIA and was approved a year ago). How big an advantage it will give any team could be open to question though, guess we'll just have to wait for testing to see. My understanding too, I was, unusually, being cynical again. So it costs 5,000,000 must be worth a tenth ! I still hark back to the Lotus active suspension. It seemed to me to be the way to go, offering something that had a future in passenger cars.